Once you have created and activated an account you are ready to log in and start the fun. Before you begin to register things on Peakbook your start page will look something like the example to the left below. Here follows a short description of this page. Home The orange color around the text tells you that this is where you currently are. Always click her if you need to reach the start page quickly. Main menu Here you will find the most general functions of Peakbook. My Peakbook Here we have put most of the functions revolving your own content. Contribute If you want to create general elements like peaks or lists, this is where you find these options. Preferences Here are everything regarding your profile, your account and other preferences and settings. Map Click here to activate the Peakbook map. This is also available from the Main Menu, but has an extra shortcut placed here. Register Tour Registering your own tours is a key feature of Peakbook and therefore this has its own shortcut here. 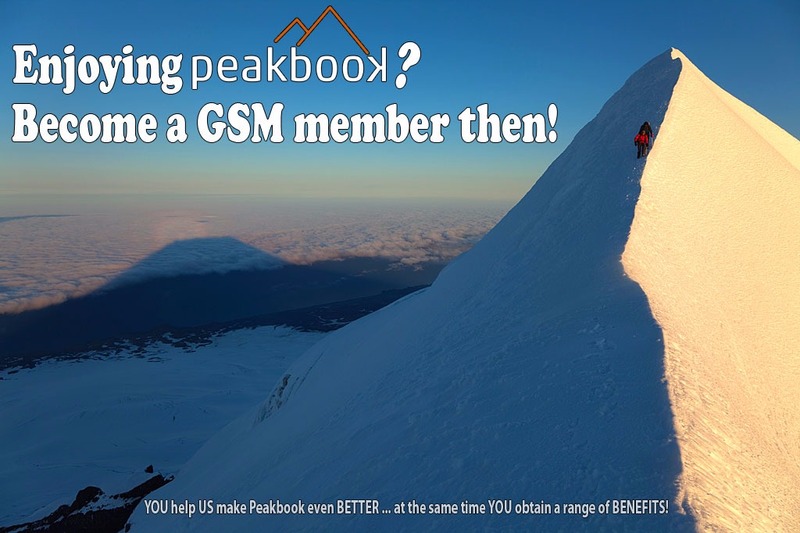 It is also available via the My Peakbook menu. Messages and Comments Messages leads to your own personal message box on Peakbook where you can communicate with other users. It will be highlighted once there are new unread messages in your inbox. Comments are not to be mixed up with general comments. Via this link here you can reach comments written by others to your own stuff or see comments you have previously written yourself. Account information Summarized information about your account. Clicking on the links here leads to more information. Summarized statistics There are several statistics available, and they will be updated once you register tours with ascents, upload images etc. Some of these elements are clickable and lead to more information. More will follow. My lists As long as you have not joined any lists this field will loke like on the image. Once you've joined one or more lists up to three of your lists will be displayed here along with a link to the rest. Random peak A random mountain from the database is displayed here. Events Before you start to follow other users on Peakbook there will only be a placeholder like in the image. Once you start following other users information about their activities will be posted here in a newsfeed. You will also receive information when other people follow you. In the future more event categories may be added. Tour activity Visualisation of your recent Tour activity. Random tour article Here is a random tour report in your desired language. As 98% of all reports are in norwegian at the moment, we recommend setting norwegian as your secondary language in the profile settings, at least if you understand some norwegian. The two languages selected in your profile are the two languages from which this random report is selected. Placeholder This is just a placeholder for the time being. Last comments Unlike the comments link under number 8, this box displays the last 5 comments posted on Peakbook by anyone regardless of where. By clicking "older" you can easily access older comments. Log out Need no explanation. Search box The Peakbook quick search box. Access advanced search found under the Main Menu for more search options. A couple of tutorial videos from the previous version of Peakbook. They may however still be of some help as the basics are pretty much the same. Remember to turn on HD for best possible viewing experience.